Unrestricted submarine warfare is a type of naval warfare in which submarines sink vessels such as freighters and tankers without warning, as opposed to attacks per prize rules (also known as "cruiser rules"). Prize rules call for submarines to surface and search merchantmen and place crews in "a place of safety" (for which lifeboats did not qualify, except under particular circumstances) before sinking them, unless the ship showed "persistent refusal to stop ... or active resistance to visit or search". 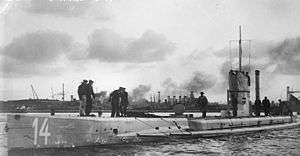 Following Germany's resumption of unrestricted submarine warfare on February 1, 1917, during the First World War, countries tried to limit or even abolish submarines. Instead, the London Naval Treaty required submarines to abide by prize rules. These regulations did not prohibit arming merchantmen; or having them report contact with submarines (or raiders) made them de facto naval auxiliaries and removed the protection of the prize rules. This rendered the restrictions on submarines effectively useless. While such tactics increase the combat effectiveness of the submarine and improve its chances of survival, some regard them as a breach of the rules of war, especially when employed against neutral vessels in a war zone. The U-boat campaign of World War I, waged intermittently by Germany between 1915 and 1918 against Britain and her allies. This was ostensibly the reason for the entry of the United States into the war in 1917, together with the Zimmermann Telegram. It was also a casus belli for the entry of Brazil into the war in 1917. The Battle of the Atlantic during World War II. Between 1939 and 1945, it was waged between Germany and the Allies and from 1940 to 1943 between Italy and the Allies. The Baltic Sea Campaigns on the Eastern Front, during World War II between 1941 and 1945, especially from 1942. Waged by Germany and the USSR against each other, primarily in the Baltic Sea. The Pacific War during World War II, between 1941 and 1945, waged by the United States and the British Empire against Japan. The four cases were attempts to navally blockade countries, especially those heavily dependent on merchant shipping to supply their war industries and feed their populations (such as Britain and Japan), even though the countries waging the unrestricted submarine warfare were unable to institute a typical naval blockade. ↑ Holwitt, Joel I. "Execute Against Japan", Ph.D. dissertation, Ohio State University, 2005, pp.5-6. ↑ Holwitt, p.92: quoting Article 22 of the London Naval Treaty. ↑ Holwitt, p.294, for instance. Holwitt, however, persistently refuses to acknowledge armed merchantmen are not protected, and most of the merchantmen sunk by both sides in World War II were armed. Ronzitti, Natalino (1988). The Law of Naval Warfare: A Collection of Agreements and Documents With Commentaries. Martinus Nijhoff. ISBN 978-90-247-3652-2. Willmott, H. P. (2003). World War I. Dorling Kindersley. ISBN 978-0-7894-9627-0.